Among the many Scandinavian dances performed by groups around the world, the competitive dances are crowd-pleasers as much for the talent of the individual dancers as for the artistry of the dance. Two forms of competitive Scandinavian dances are often chosen: stick dance variations and the halling. This article gives an overview of these two forms, and a little bit of history for each. Ruth Drake and the author dancing Tikkuritsu, a Finnish stick dance, at the Oregon State Fair. Photo credit: Heather Butler Skogen. Stick dances, also known as korsdans or krossdans, are competition dances executed by one or two dancers over a pair of crossed sticks. 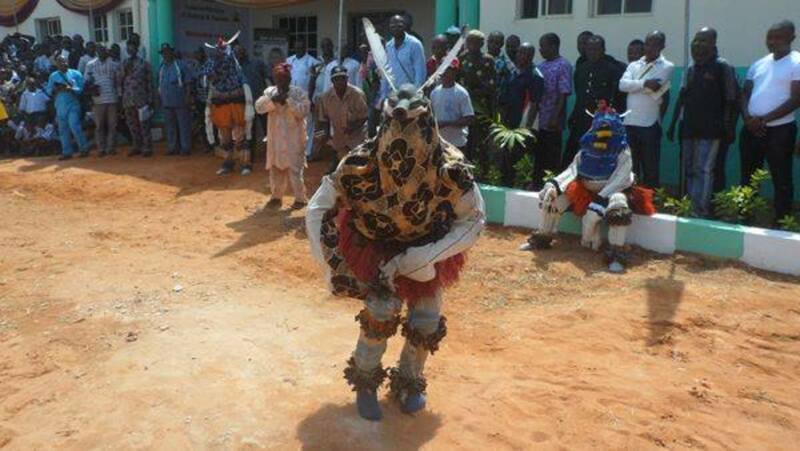 Stick dances were used sometimes as a way to settle disputes between men at parties or other large gatherings. The participants would take belts, broom handles, or other objects and lay them on the ground in an X figure, then dance around them. Whoever was the last one standing without missing a step or stepping on the X was the winner. Nowadays, stick dances come in many forms: two people per X, individuals with their own X competing against each other, and as a figure in group circle dances. Each Scandinavian country has its own variation of the dance, as well as some local variations. 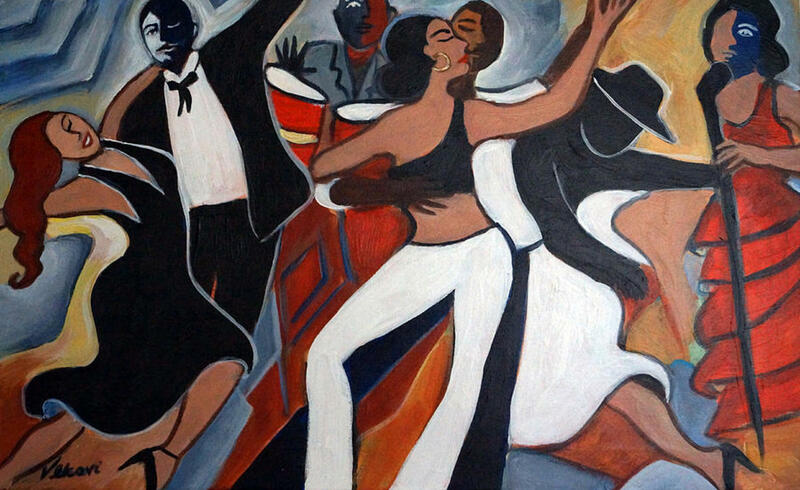 In performances, both men and women can dance most variations of stick dances. 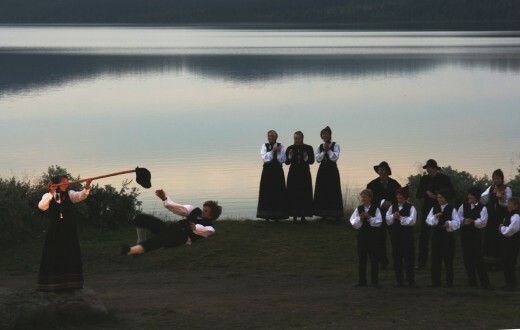 Young boy performing a hallinkast (kick the hat maneuver) in a dancing scene from an outdoors performance of Peer Gynt at Gaalaavannet. Photo credit: Marcus Ramberg. The halling dance, also known as lausdans, is a men-only performance dance. Sometimes it is danced in turn by more than one young man, but even if danced by only one, it is still a competitive dance by nature because of the sheer strength and gymnastics involved. It is a dance of pride, of showing off, and of strength. 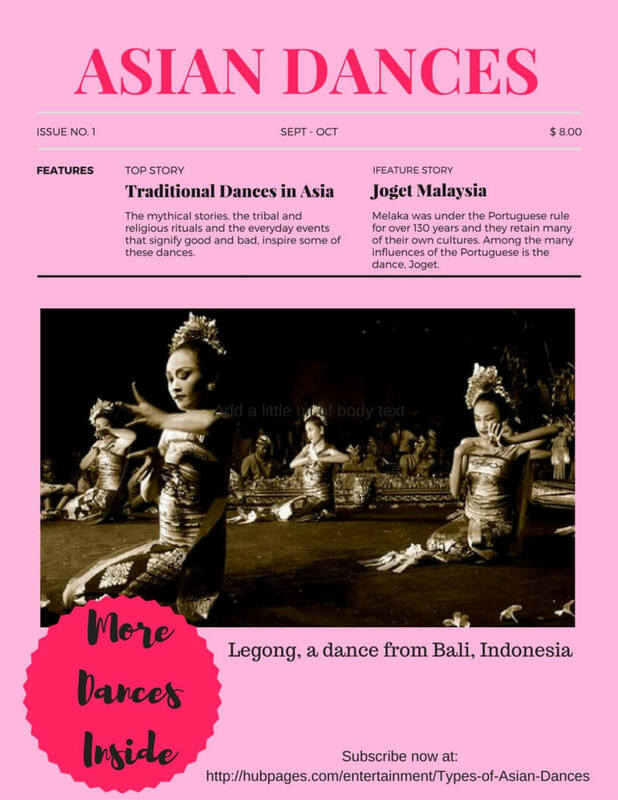 Traditionally danced at weddings, community events, and other grand occasions, it is a chance for young boys to show their skill in front of their friends and neighbors. The halling is individual to the dancer. 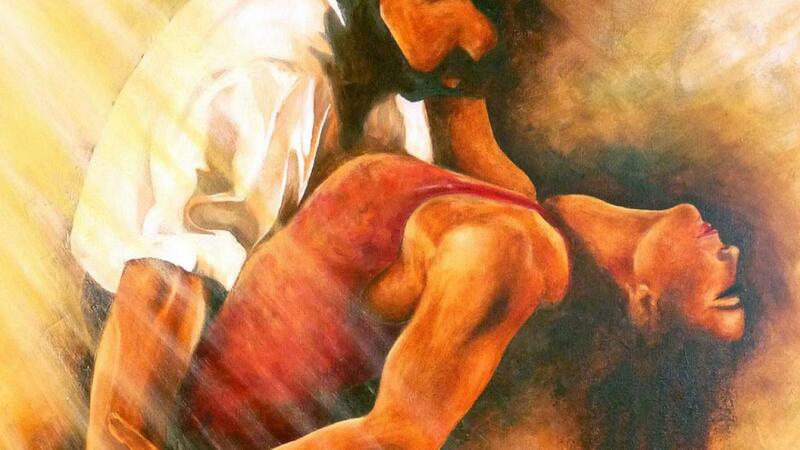 Each man decides his own form, based on the traditional elements and his own ability to execute them. 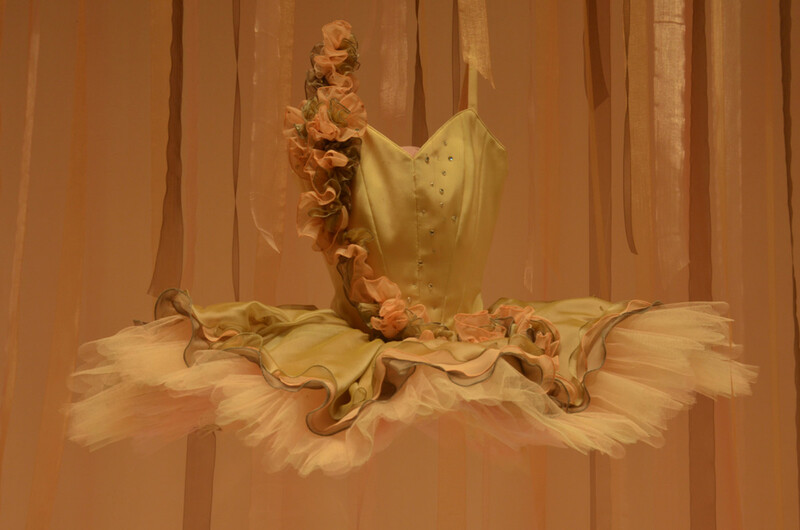 The elements that can be integrated in the dance are push ups with clapping, squats, kicking the leg out during squats, dancing around in a circle with arms open, jumping over the leg while holding it, and kicking the hat. Kicking the hat, demonstrated in the above picture, is the most well-known element of the dance. The other elements lead up to the hat element, and prepare the dancer for it. 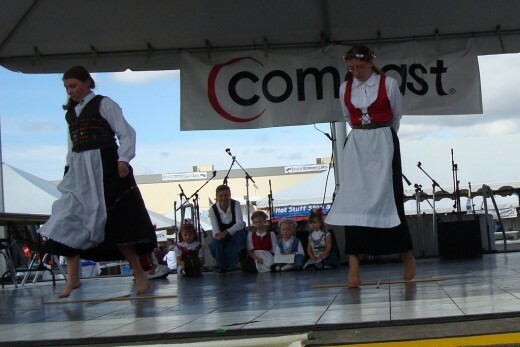 The dancer can determine the length of the dance as well, and the height of the hat, and can also interact with the crowd and the musicians during the dance, which is uncommon in other Scandinavian dances. Dance music, instruction books, and DVD of performances available. Halling and korsdans included on 2008 cd, halling included on most years, korsdans included on 1993. Edvard Grieg: Halling - Norwegian Dance opus 38 no 4 in G Minor from Lyric Pieces - piano sheet music to print instantly. This piece is level 6 and was composed during the Early Romantic period. Traditional dance music from Norway, including korsdans. This cd is also available in the US.